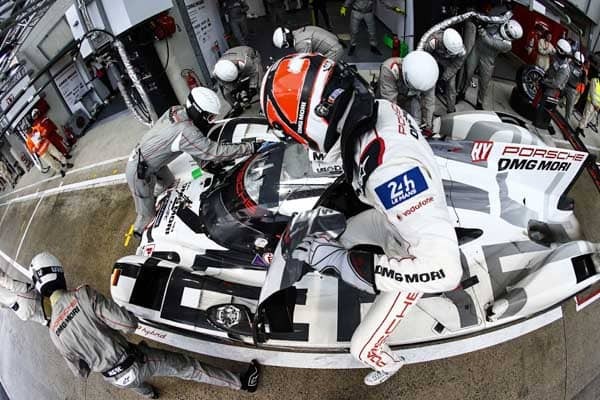 The official pre-test on Sunday in Le Mans was as busy as it was positive for the Porsche Team with its three 919 Hybrids. This day provides the only opportunity to test on the 13.629 kilometre long Circuit de la Sarthe. More than nine kilometres of the track consist of what are normally public roads. In total, the nine drivers sharing the three cars, which are carrying future technology with their power system of over 1000 HP, completed 124 laps. Porsche works driver Brendon Hartley (New Zealand) set the fastest lap time of the 67 cars taking part in the pre-test. He lapped the circuit in 3:21.061 minutes during a dry period in the afternoon. As a comparison: In 2014 the fastest 919 driver in qualifying was Romain Dumas (France) with a lap of 3:22.146 minutes, which back then was good enough for P2 on the grid (last year’s pole time: 3.21,789 min/Toyota). Changing weather conditions in the West of France provided the team with challenges regarding set-up work, but also with the opportunity to test on a dry, a damp and a fully wet track.